The Radio in our Jeep didn't work and we decided Memorial Weekend was the time to replace it. 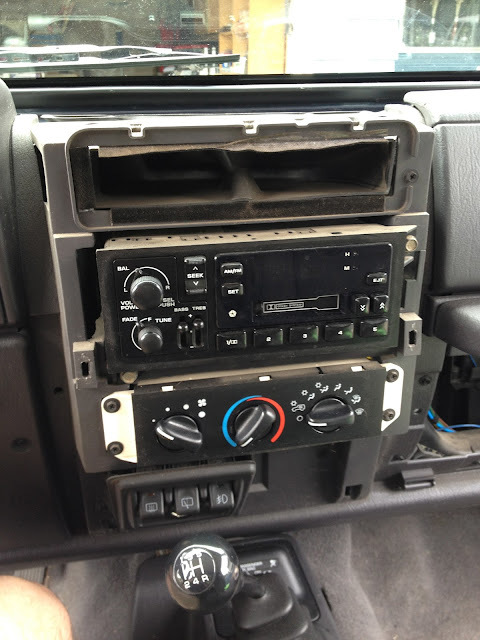 There are plenty of video tutorials on youtube that explain how to switch out a radio, so instead... here's what we did... in pictures! First we took all the shroud off. It was surprising simple. Jeeps are awesome like that. A bunch of speaker wires. Too bad colors are not standard. But there's the Internet to help! The new radio used a new connector. Lots of crimping and double checking wires. Oh yeah! Got them all, and they all work! What the new radio looks like. That shroud piece is universal, you just cut off the tabs you don't need. All done! The new radio works great. We took a ride to get ice cream to "test it". Who Kept The Dog Out? !